On Saturday, July 21, the Herndons will lead us to Highland Rim Speedway for an evening of racing thrills. 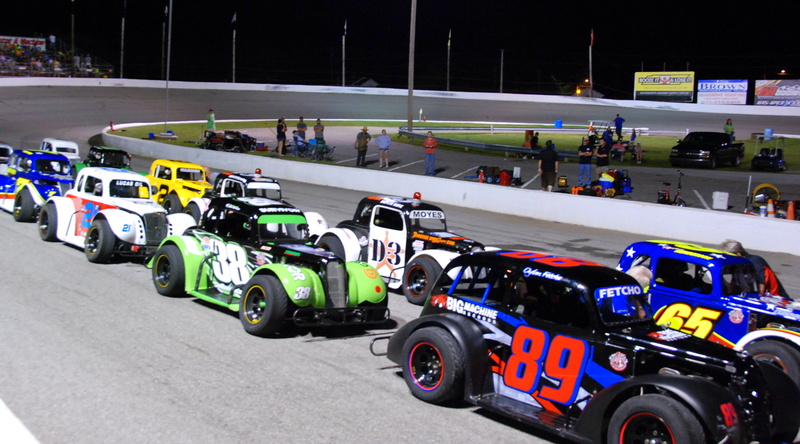 Join us as we celebrate the time honored southern tradition of short track stock car racing. Bumping and the trading of paint are common occurrences along with the occasional heated out-of-car argument. We’ll indulge in another southern tradition along the way — dining at a great catfish restaurant. We’ll begin at the Goodlettsville Cracker Barrel, exit 97 off I-65 at 11:30 AM with a driver’s meeting at 11:45am and depart soon after. Roy will take us through some of his favorite backyard twisties on the way to the restaurant. After we fill our tummies, we’ll head over to the race track for the evening’s entertainment. The track feature that evening will be the former old time racers with their classic cars with regular racing following the feature. The Catfish House in Springfield is one of the Herndon’s favorites. Inspired by the elements of exceptional food, with a nautical relaxing atmosphere combine for a memorable dining experience. They offer the highest quality grain fed, farm raised catfish. If you’re not a catfish fan, no worries, they offer a diverse menu that offers a wide variety of steaks and seafood. Their shrimp are said to be the best in Middle Tennessee, rivaling even those found along the Gulf Coast. All selections are prepared fresh daily…and don’t forget to leave room for a piece of one of their homemade pies. Highland Rim Speedway in Greenbrier is a track rich in history – over 50 years worth!. A group of neighbors joined forces to build a quarter mile dirt track opening in the spring of 1962. In 1969, the track was paved and quickly became the fastest high banked asphalt track in the region. Further modifications brought Highland Rim to its current configuration a high banked “D” shaped asphalt track and faster than ever. NASCAR legends Darrell Waltrip, Bobby Hamilton, Bobby and Donnie Allison, and Red Farmer have all taken on the high banks of the Rim. And don’t forget about hot shoes like Casey Atwood and Bobby Hamilton Jr. who both got their stock car racing start at the Rim. Today, it still provides edge of your seat thrills as one of the fastest quarter mile tracks. If you want to join us, let the Herndons know by July 18th at lpherndon@comcast.net. Tickets for the race will be just $12 each and can be bought at the gate. Come join us for an afternoon and evening of fellowship with your Miata brethren, racing thrills and some great catfish.